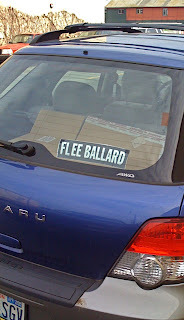 Not so long ago, our staid Scandinavian neighborhood inspired the ironic bumpersticker "Free Ballard." But the invasion of condos, condo denizens, cocktail bars and cryptically named boutiques, coupled with the disappearance of most of the street parking, has inspired a slight modification of the slogan. great photo! you gotta wonder, if it's that dire, why hasn't that driver moved already? The driver probably hasn't moved for the same reason I haven't: There's no where like the old Ballard to go! Increasingly the choice is either soul-less suburbs with no town center (just strip malls beside high-speed roadways) or city neighborhoods increasingly given over to skinny houses and high-rise apartments and condos. The few true city neighborhoods yet unaffected by condos are impossibly expensive (the northeast end of Capitol Hill, or Madison Park, for instance). MIddle-class people who though they could have a house, a yard, and a reasonably quiet existence are stuck. Ironically, I took that picture of the car after parking four blocks away from Cash and Carry at 11 a.m. on a weekday -- Why? Because the Mars Hill Church members were going somewhere on a field trip in buses and a few hundred (!) of them were using all the available street parking for the day.